Tutubi went on a company summer outing in Bagac, Bataan just last week at a controversial "heritage" resort along with his parents where he also took them, to their surprise, to the towering Dambana ng Kagitingan on top of Mt. Samat in Pilar, Bataan before taking them to the HM Transport bus terminal in Cubao. 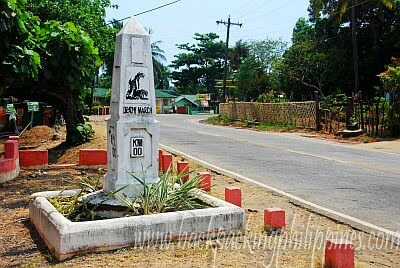 Along the fork of the road leading to Bagac town proper is a relatively unnoticed and forgotten historical marker on one of the two spots where the Bataan Death March historically started (the one is in Mariveles Bataan, the town at the tip of Bataan Peninsula near the fortress Island of Corregidor). This is Tutubi's post on the anniversary of the infamous Bataan Death March which started on April 9, 1942, the historic Fall of Bataan. Note: some peole claim the many wicked soldiers of Death March were Koreans conscripted into the Japan Imperial Army. Note that Korea was part of the Empire of Japan during the World War II. Tutubi will someday visit the other Kilometer Zero marker of the Death March plus the trains stations in San Fernando, Pampanga and Capas, Tarlac to finish the World War II historical trail (along with a Bataan Death March Route Map, in Japanese: Batān Shi no Kōshin (バターン死の行進?). There's also the Bataan Death March Marathon Run event some years ago but not sure if still held this year.). good to know that history is still preserved in the country. It is a myth that the cruel and inhuman treatment of American and Filipino prisoners on the Bataan Death March was at the hands of Korean soldiers conscripted into the Japanese Army. Korea may have been "part of the Empire of Japan" during WW2, but not by choice. It is not uncommon, however, for Japanese people to make this assertion in modern times. However, the Japanese spin at the time was "the prisoners were humanely treated". So the story changes with each generation, and understandably so, as it is difficult to deal with the sins of one's ancestors. 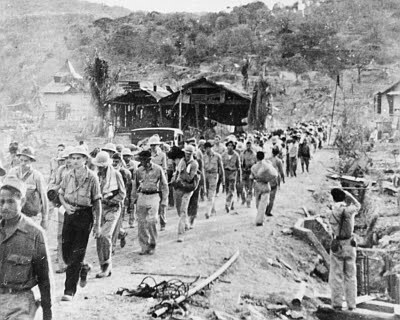 The Bataan Death March was all the doing of the Japanese Army, under the command of General Homma, who was convicted of war crimes and executed just outside Manila. I have been to both zero kilometer markers, followed the entire route from both Mariveles and Bagac to San Fernando, and from Capas to Camp O'Donnell. I have an uncle (now deceased)who survived this horror. I will take his word for who the guards were. He was there. anonymous, yes, you're right the koreans had no choice but they're really here, per historians, who interviewed not one but many survivors. note too that homma was the commander but he was busy capturing corregidor when the death march occured and was not directly involved in it. Wiki is your friend... Wiki Japanese atrocities. "Two Japanese officers, Toshiaki Mukai and Tsuyoshi Noda competing to see who could kill (with a sword) one hundred people first. The bold headline reads, "'Incredible Record' (in the Contest To Cut Down 100 People—Mukai 106 – 105 Noda—Both 2nd Lieutenants Go Into Extra Innings"."